"A recipe for boiled chicken; boiled chicken meat is called for in many other recipes, and is a wonderful basic recipe to have for many uses." Place chicken in a large pot with onion, carrots, celery and peppercorns; add water to cover. Cover pot and bring to a boil; reduce heat to a gentle boil and cook for about 90 minutes, or until chicken meat is falling off of the bone. Remove chicken, let cool and shred or chop the meat. A complete, one-pan meal that’s in the oven in just 15 minutes. Here is a hint to ensure that your chicken is always juicy, never dry - cool it completely in the broth before shredding or cubing! Works like a charm. 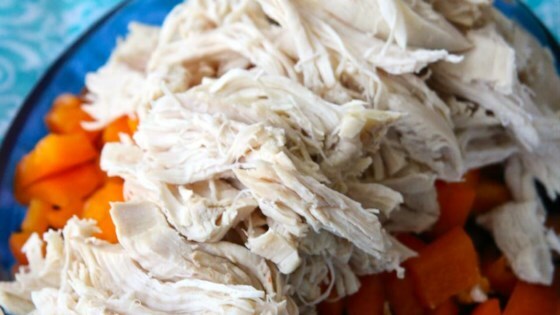 Best recipe for boiled chicken I have ever used - and the broth is great for making soups, too!